Lindsey MacDonald wants to give University of Michigan students, faculty and staff a chance to get their hands dirty. 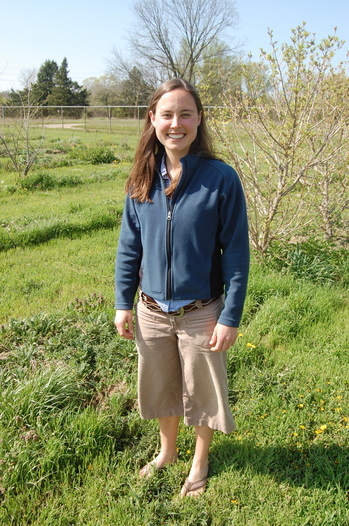 MacDonald is one of four School of Natural Resources and Environment graduate students working to establish a campus farm on the grounds of Matthaei Botanical Gardens. The farm would bring people from a number of academic disciplines together to plan, implement and work on a small farm while also creating a centralized sustainable food program at the university. Lindsey MacDonald, University of Michigan masters student in the School of Natural Resources and Environment, is working to establish a campus farm at the botanical gardens. She on standing on the land, an old nursery for the botanical gardens, which would be used for the farm. At the same time, a campus farm would increase the amount of locally grown food served in the dining halls across campus and could allow students to purchase CSA (community supported agriculture) shares or even supply a new student food cooperative taking root on campus, said MacDonald. As a first step, a pilot farm – a 250-square-foot plot – is being established this spring at the botanical gardens, on land adjacent to the proposed farm, which currently is unplowed. It will be used to test crops and the harvest will be donated. “It will allow us to get our hands dirty,” MacDonald said. Eventually, MacDonald said, plans include establishing a one- to two-acre farm on the botanical gardens grounds, on land that at one time served as a nursery for the gardens. A farm manager would be hired to run and coordinate the operation, MacDonald said. That could happen as early as next year if funding can be found, she said. But that’s the hitch. MacDonald and the other graduate students won a $42,000 grant that can be used to fund the farm – buy equipment and fund interns to work the farm. But the grant hinges on first hiring a farm manager, a move that could cost between $60,000 and $70,000 a year. MacDonald said they are looking to foundations, alumni and a number of university departments for help with funding. While the -local food movement has been growing in Washtenaw County, U-M has not moved forward on the idea of a campus farm. The idea of a campus farm has been discussed for at least the past six or seven years, said Bob Grese, director of the botanical gardens and Nichols Arboretum.